Were you shocked and outraged after last month's Navy Yard shooting? Were you even more shocked that for the most part, the media and many elected officials were unfazed by this massacre -- 12 more names added to the long list of people lost to gun violence in the US? So were we. Events like the Navy Yard shooting are discouraging to say the least, and may prompt us to ask, "why are we bothering?" At times we may feel hopeless. In these moments, it's important to keep things in perspective. This is a long, long battle, and we are only at the beginning stages of it. Since The ENOUGH Campaign formed in the wake of the Sandy Hook massacre, much progress has been made. Common-sense gun legislation passed in CT, CO, MD, DE, NY, and CA. Thousands of moms and dads and regular people are speaking out, calling their elected officials, tweeting, talking to neighbors and friends -- many for the first time -- about the need to end gun violence in the US. There is a new focus on mental health and its relationship to violent acts. Starbucks and other retailers have changed their policies to clearly state that weapons have no place in their stores. Congress finally, FINALLY approved a new director, Todd Jones, for the Bureau of Alcohol, Tobacco, and Firearms. Yes, we have had setbacks, but they are outnumbered by the victories. And none of it would have happened if we had given up. As we approach the one-year anniversary of Sandy Hook, let us each renew our devotion to activism and find new ways to work together to make our world safer. It's working. NEWTOWN, Conn. -- The family of a teacher killed in last December's school shootings in Newtown is hoping to get dozens of people dressed as flamingos to run the streets of Stratford. They have organized a road race, the Vicki Soto 5K, for Saturday, Nov. 2, in Soto's hometown. Victoria Soto was a 27-year-old first grade teacher at Sandy Hook Elementary School who authorities have said hid students and tried to shield others from the gunman who killed 20 children and six women. Eleven students in her classroom survived. Proceeds from the race will go to the Vicki Soto Memorial Fund, which provide scholarships to students seeking to become teachers. The misogyny that one encounters when dealing with many fervent advocates of the Second Amendment is something that puts many women off pursuing discussions about gun control online. It's difficult to determine whether these displays are more about a hatred of women, per se, or more about an aggressive defense of a particular type of masculinity. It is all too common for boys to grow up hearing phrases like "be a man", "don't be such a p*ssy" and "stand your ground". Far too many boys are taught that growing up to be a man means rejecting any part of them that might possibly be viewed as a feminine or "weak". And it means enforcing this guy code among their peers; ridiculing their male friends that might act outside of these rigid gender constricts. These are the rules of socialization for boys in an astounding percentage of our culture. Many mothers also reinforce these rules, in order to help their boys "fit in" to their popular youth culture. Our media and entertainment bombards boys with messages of "toughness" and violence. The video games they play more often than not involve shooting firearms. The movies that top the box office are mostly celebrations of this masculinity and violence. Much popular music reinforces gender stereotypes and further encourages boys to play into these tough guy roles. And for boys that grow up in homes with guns, the real gun culture can start young -- for entertainment as well as for defense. If an adult male role model has taught a boy that defense with a gun is the way to "be a man", how many boys would turn away from that activity? Most will embrace it and internalize it as part of their masculinity, even, perhaps, if their community sends a different message. Even more unfortunately, sometimes that masculinity includes the concept of defending surrounding citizens from "bad guys", even without the consent of those citizens. Men who grow up with rigid views of masculinity are also more likely to have rigid views of femininity. Rigid views on gender roles, and a belief that one is entitled to be in charge of a relationship, is one of many warning signs of domestic abusers. October is Domestic Violence Awareness Month and many gun safety organizations are helping to raise awareness that guns in the home raise the death rate for domestic violence victims. Domestic violence assaults involving a firearm are 12 times more likely to result in death than those involving other weapons or bodily force. Is it any surprise that gun rights groups have targeted Moms Demand Action with the misogynistic slur, Thugs With Jugs? Casting female gun rights activists as the bad guys in the clich� that gun control advocates want only to take away their guns. This translates to not just taking away and invalidating their internalized masculinity but also exposes the fear they've been fighting off with their gun ownership. One of the least helpful things an advocate for gun safety can do is to ridicule a misogynistic gun advocate's masculinity. It only exacerbates the problem. If we want to solve the plague of gun violence in our country, we not only need to advocate for safer gun laws, but we must recognize the roots of the behaviors creating the violence, and change our ways for the future. Among its findings, a 2011 study found that a majority of gun shop owners supported comprehensive background checks that include provisions barring people from purchasing firearms if they have a history of everything from mental illness to alcoholism-related crimes. NRA Tried To Stifle Study Showing Gun Retailers Support Background Checks. An NRA member himself, the professor who spearheaded the aforementioned study received a warning from the National Rifle Association urging members not to participate. 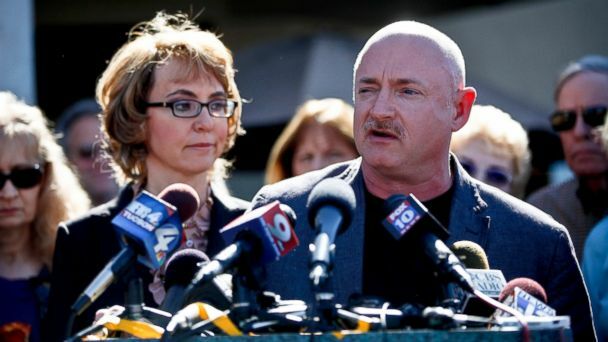 Former astronaut Mark Kelly started the gun control group Americans for Responsible Solutions ten months ago, when, while visiting China, he learned of the deaths of 20 children in Newtown, Conn. It was almost two years after his wife - former Rep. Gabby Giffords - had been shot. Ten months after Newtown, the group continues to grow and has raised over $11 million from 130,000 donors, Kelly told ABC News on Friday. Now, Kelly, Giffords and their team want to turn those funds toward the 2014 midterm elections. "We would like to spend in the 2014 elections what the NRA spent in 2012," he said. The National Rifle Association spent roughly $19 million during the 2012 election cycle, and Kelly said he was confident his group can match that. "We've got the resources to be effective for the 2014 elections," he said. But confidence in gun control groups like Americans for Responsible Solutions and Mayors Against Illegal Guns, backed by New York City Mayor Michael Bloomberg, may be even more shaken after this summer's successful recall of two Colorado state senators who supported stricter gun legislation, as well as the Senate's failed attempt in April to pass a background checks bill. "You've got to give [gun lobbyists] a lot of credit, especially the NRA has done a fabulous job in trying to accomplish what their goals are," Kelly acknowledged. Given the NRA's grip on Capitol Hill, Kelly said, "our goal is to eventually have an organization that is as formidable as the gun lobby." On Sunday, Kelly, Giffords and Americans for Responsible Solutions executive direction Pia Carusone will join New York Attorney General Eric T. Schneiderman at the Saratoga Springs Arms Fair to talk about the state's efforts to implement a firearm background check and tracking system at these shows. "At the federal level, we still have no requirement for background checks at gun shows, but states like New York are fixing the loophole," Kelly said in a statement. "This is a chance for Gabby and I to visit New York's largest arms fair and highlight this background checks system, which we believe can serve as a template for gun shows around the country." And polls show that Americans for Responsible Solutions and other groups that support stricter gun laws have the support of the public. An April Gallup poll found that 83 percent of Americans support instating background checks before every gun purchase. "The interesting thing about this issue is that we don't have to change anyone's mind about the policy. ... You just have to change their mind about the politics," Kelly said. "You've got to give them the confidence that they can stay in office, and I think we can do that." An internal memo obtained from the National Football League limits permission of off duty law enforcement officers to carry guns into their stadiums. The NFL says that there is already enough security at stadiums on game days without the need for an armed off-duty police presence. The NFL statement to WBAL Radio in Baltimore says that off-duty cops at the game should be treated the same as spectators. Since off duty cops are not briefed on game day law enforcement planning strategy, their carrying a gun can be dangerous. Unlike cops on duty, off-duty cops are permitted to drink alcohol at the event. Alcohol can cause impaired judgment and therefore makes an off-duty cop with a gun a liability. Certain local laws, such as in Baltimore, MD and Texas, supersede NFL policy. But the policy will remain intact where applicable. NEW YORK - One week after the mass shooting at the Washington Navy Yard which left 12 dead, anti-violence advocates and families of victims of the December 2012 massacre at Sandy Hook Elementary School rallied at the headquarters of Cerberus Capital Management to demand that the hedge fund immediately sell all investments in Freedom Group, the company that manufactured the assault rifle used in the Newtown shooting and the shotgun reportedly used in last week's shooting in Washington, D.C.
Cerberus has not sold a single penny of its 94 percent stake in Freedom Group (now officially called Remington Outdoor Company Inc.), despite making a public commitment to divest in the days following the December 14, 2012 shooting. Freedom Group is the leader in marketing high-capacity, military style assault weapons such as the Bushmaster XM-15, the assault rifle with a 30-round magazine used by Adam Lanza to murder 20 elementary school children and six educators at Sandy Hook Elementary School. Freedom Group is also one of the largest donors to the National Rifle Association. According to a new report by the Violence Policy Center (available online at http://www.vpc.org/studies/bloodmoney2.pdf), the firearms industry has donated between $19.3 million and $60.2 million to the NRA since 2005, helping to block the passage of meaningful federal legislation to prevent gun violence. "We know the terrible price of business as usual all too well. Companies like Cerberus profit from the sale of deadly assault weapons and the NRA's obstruction of commonsense gun control-all while our communities are victimized," said New York City Public Advocate and mayoral candidate Bill de Blasio, who has successfully pushed hedge funds and other major investors to end their investment in assault weapon manufacturers. "Cerberus needs to honor its promise to the victims of Sandy Hook and to all Americans whose lives have been turned upside down by gun violence by ending its investment in this destructive industry." Since Newtown, ten of the largest hedge funds and money managers have completely divested their gun holdings, valued at $170 million. Twelve more firms have scaled back their gun investments by 5.7 million shares-25 percent of their holdings. U.S. Rep. Charles Rangel (D-NY-13), and Geoffrey Eaton, President, NAACP Mid-Manhattan Branch in NYC, joined Newtown families to demand a meeting with Cerberus and deliver a letter (available online at http://unloadtheguns.com/) on behalf of more than 30 advocacy groups telling CEO Stephen Feinberg to keep his promise without further delay. Last week, California Gov. Jerry Brown signed 11 new gun laws and vetoed six others. Among the vetoed bills is AB 180, which would have allowed Oakland to pass gun control measures that are stricter than the state norm. SB 299 would have required owners to report stolen guns within seven days. SB 374 would have banned the sale of semi-automatic rifles with removable magazines. And SB 755 would have added drug abuse convictions to the list of what would prohibit someone from owning a gun for 10 years. Parents at a North Carolina school are upset after a staff member came to classes dressed up as an armed robber. The ENOUGH Campaign is comprised of individuals, like you, who have had ENOUGH!! Currently, we have 500+ friends on Facebook, close to 600 followers on Twitter, and 800+ subscribers to our e-newsletter. We are so grateful for all those supporting our mission to end gun violence, and our voices, along with yours, continue to speak volumes. Please continue to speak out! If you haven't already, "Like" The ENOUGH Campaign on Facebook and follow us on Twitter. Here you'll get up-to-the-minute news, relevant news story links, petitions to sign and more. We love when our friends join the conversation, and we look forward to your points of view. Let's talk! A brief history: In the wake of the Newtown massacre, several moms from Fairfield County, CT (just downcounty from Newtown) banded together to form The ENOUGH Campaign, a grassroots community organization created to protect families and citizens of Connecticut from gun violence through advocacy and education. It's people like you that help The ENOUGH Campaign stop gun violence and promote safer communities. Thank you! The ENOUGH Campaign is a 501 (c) 3 non-profit organization, filing status in progress. Please share this email with others.